Zhangye lying in the centre of the Hexi Corridor, was an important outpost on the Silk Road. It had been under the rule of the Xiongu, Tibetans, Uyghurs and the Western Xia. 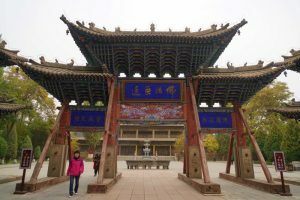 The Mongol Emperor Kublai Khan is said to have been born in the Dafo Temple. Marco Polo had spent a year in the town during his journey to China. After seeing our friends off, Bing and I had a siesta before heading to the compact city centre. We spent over an hour at the Dafo (Great Buddha Temple) 大佛寺, an ancient Buddhist temple notable for its gigantic 35m-long reclining Buddha statue (a nirvana image) made around 1100 AD during the Western Xia and Song Dynasty. The well-preserved temple is surprisingly interesting with good illustrations, the best I have seen on this trip. 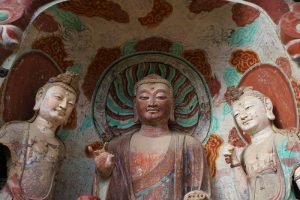 Apart from having the country’s largest indoor clay Buddha images, it has rare scripts from the Ming Dynasty that were handwritten in real gold and closely related to the royal family of the Yuan Dynasty. Another small museum is also located inside the temple with many Buddhist relics unearthed in a stupa nearby. built in early 557-558 AD of the Northern Zhou Dynasty. 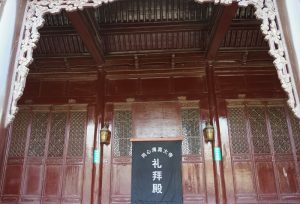 Last renovated in the Qing Dynasty, it looks well-preserved from the outside. But we could not go in as it was already closed. It started to drizzle. We walked to the night market for dinner and had a simple meal for less than ¥40. We were back in the hotel before 7:30pm. Today, we had a new driver and a small car which cost ¥1000 a day. 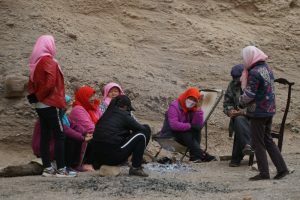 (The 11-seater for eight from Dunhuang to Zhangye only cost ¥1,400 a day). Su is 31-year-old and does not drive too steadily. We took the highway to Wuwei 武威 (formerly known as Liangzhou 涼州). 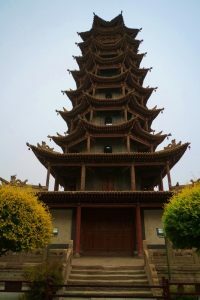 Strategically located on the only route in ancient times from central China to western China and the rest of Central Asia, Wuwei has a long history and rich culture. It was also the ancient capital city of five Liang states and the auxiliary capital of Western Xia. The discovery of the Leitaisi Tombs in 1969 bought this ancient city to limelight. 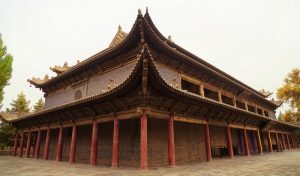 The tombs, a joint burial site of General Zhang and his wife, contained 211 relics and artefacts including gold, silver, copper, iron, stone and jade wares, lacquer and potteries. 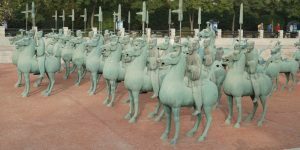 Among them are 99 exquisite samurai ceremonial figurines including the “Bronze Flying Horse”銅奔馬. We had a full visiting six attractions. 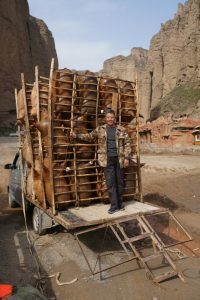 Gansu is generous with the elderly and I had half-price tickets at three locations. White Pagoda Temple 白塔寺 (¥20). 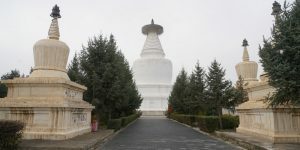 There are several important monuments inside the park namely 108 white pagodas and the remains of the ancient White Pagoda Temple. 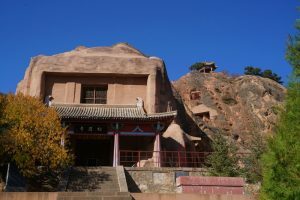 A historic meeting between Sagya Pandit Gonggar Gyamcan, a Tibetan religious leader, and Prince Godan of Yuan Dynasty was held in the temple in in 1246 to discuss the conditions to pledge allegiance to the Mongols. Today, there is a museum with exhibits on this meeting, Sagya Pandit Gonggar Gyamcan and Tibet as part of China. 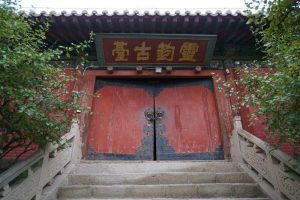 Wuwei Confuican Temple 武威文廟(¥15). Built in 1437-1439, is an architectural complex with imperial style and grandeur and the largest temple of its kind. 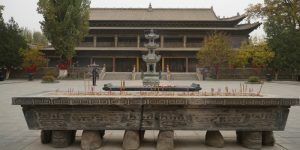 The Wuwei City Museum, the second largest history museum in Gansu, is located inside the temple with some 44,000 relics and antiquities. 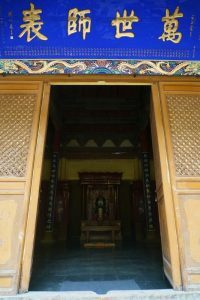 Da Yun Temple (¥5). The temple was almost destroyed by earthquake. Today, only an imposing drum tower still stands. 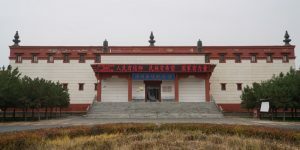 Wuwei Municipal Museum (free). 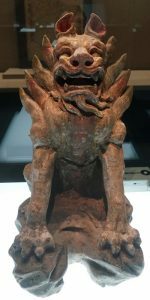 There is a good collection of cultural relics with over 6,000 relics ranging from the Neolithic Age c.8500-c.2070 BC to Qing Dynasty (1644-1911 AD). 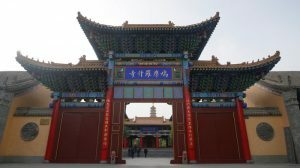 The main buildings decorated in the style of the Wei and Jin dynasties, consists of four exhibition areas. 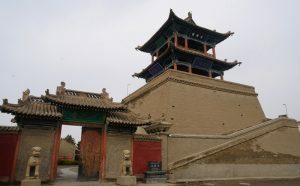 Visitors can have a good introduction to the history of the Western Xia (西夏)or Tangut Empire that existed from 1038 to 1227 AD in today’s provinces of Ningxia, Gansu, eastern Qinhai, northern Shaani, northeastern Xinjiang, southwest Inner Mongolia and southernmost Outer Mongolia with an area about 800,000 km2. 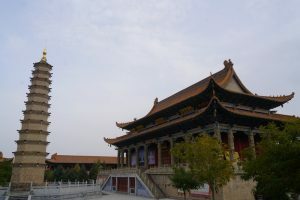 Most of its written records and architecture were destroyed when its capital Ningxia was destroyed by the Mongols in 1227. Its founders and history remained obscure until 20th-century research in the West and in China. The Western Xia despite its short extensive made significant achievements in literature, art, music and architecture. 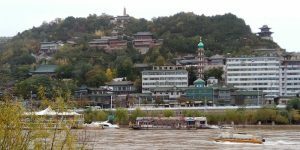 Kumarajiva Temple Pagoda鳩摩羅什寺. 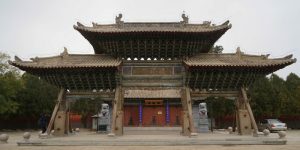 The temple was first built in Eastern Jin and Southern and Northern Dynasties (384-403 AD). Kumarajiva (344-413 AD), a Buddhist monk, scholar, philosopher, and one of the four greatest translators of Buddhist scriptures, arrived here in 384 AD and stayed in the temple for 17 years to spread Buddhism and translate. 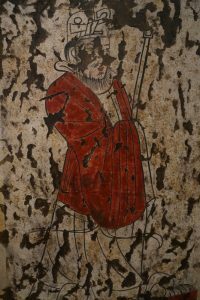 He died in Xian in 413 AD. 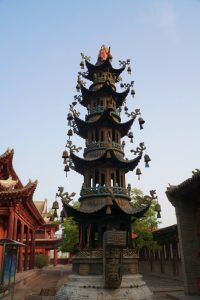 Most of the buildings in the temple are new except the pagoda dedicated to the relic of the revered monk. We tried to visit Haicang Temple海藏寺, a well-known ancient temple built in the Jin Dynasty with an area of 11,600m2. It was a key temple on the Silk Road. As the lake in front of the temple and the park complex are under renovation, the temple is closed. I slipped in. 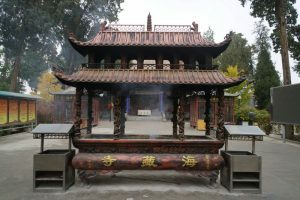 The wooden temple with many old trees in the courtyard is elegant and atmospheric. It was about 6 pm when we checked in the Hangting Hotel, a popular chain in China. We paid about ¥300 for a comfortable twin room and had noodles for dinner. Before leaving Wuwei, we went to the Leitai 雷台Park. Leitai is an earth rammer platform measuring 8.5m high, 106m long and 60m wide. 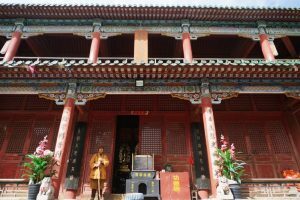 In mid-Ming period, a Taoist Temple was built on the platform. We came here to look at the famous Han Tombs of General Zhang. The tombs divided into the front, middle and rear room, was discovered when farmers were digging at a corner of the platform in 1969. Unfortunately, the museum is closed for renovation. 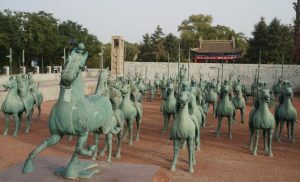 Today, about 100 life-size sculpture of men, soldiers, maids and horses modelled on the collection unearthed in the tombs are installed in the park. Bing and I had a quick tour of the temple. 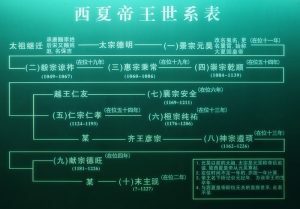 The existing structures on the platform include the Sanxing Hall, Leizhu Hall, Big Dipper Hall, Sagittarius Six Star Hall, Passing hall, halls at the west and east sides. At 9 am, we left Wuwei and drove three hours to the Yellow River Stone Forest, a geo-park established in Longwan Village in Jingtai county. Covering some 34 km2 and formed by the rising of the Earth’s crust, this forest is composed of many sand stalagmites and stone pillars in various sizes and shapes. 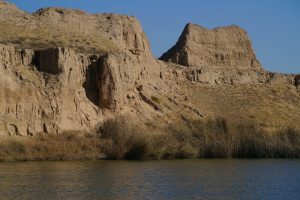 Unique and beautiful patterns on cliff sides have been formed by water and wind erosion. I paid ¥20 for a half-price ticket but ¥45 for a shuttle bus run by the park authority. 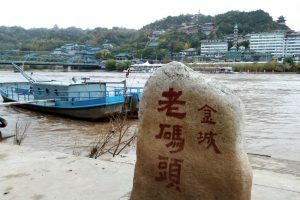 When we arrived at the pier in Longwan Village, we paid another ¥90 for a ride on a raft made of inflated sheepskins. We drifted downstream of the Yellow River and arrived safely at the entrance of the stone forest. It’s our first ride on this ancient mode of transportation. The river flows fast with some strong currents. The ride is not cheap. But I am glad to see villagers reaping economic benefits from tourism. Once we stepped off the raft, we had to decide whether to take a donkey or horse ride or walk several kilometres. A lady with a small truck offered to take us for ¥10 each. 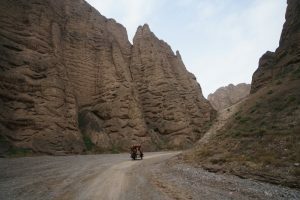 We took a ride and enjoyed the spectacular landscape with sand cliffs rising on both side of the canyon. Then we paid ¥60 each for a cable car ride to the ridge for panoramic views of the forest. If one has time, one can walk to the top of the ridge within half an hour. The landscape with the winding Yellow River, surrounding desert, oases and farm land in a distance are spectacular. I find it more beautiful and enchanting than the Stone Forest in Kunming. The lady waited for us and took us to the shuttle bus stop for ¥15 each. Again, we had to take two shuttle buses to the park entrance. At 5 pm, we were back on the road taking the highway to Lanzhou which I visited in 1991. We stayed at Ibis Hotel in the old city centre. After dinner, I made my way to Wanda Vista Hotel to meet up with Josephine and Kong who were on a Silk Road trip with a group from Vancouver. I discovered in the morning from WeChat that they were travelling in the same area. A great coincidence! We were thrilled to catch up and talked till 10:30 pm. Life is filled nice surprises. Lanzhou 蘭州 the capital and largest city of Gansu and located on the banks of the Yellow River, it has been a major link on the ancient northern Silk Road. It is a centre for heavy industry and petrochemical industry. Today, the central urban area of the city has some 3 million inhabitants. Before setting off at 9 am, I spent half an hour exploring the area near the hotel and walking along the river. I saw the Baita Mountain Park across the Zhongshan Bridge, the first permanent bridge over the Yellow River. I can’t recall spending much time in the city in 1991: we had a photo stop at the Yellow River Mother sculpture at Little West Lake. Lanzhou has changed so much since. Though there are a couple of museums we can visit, we do not have time. 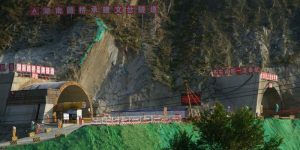 Highway to the Maijishan Grottoes 麥積山石窟 is still under construction. As a result, we took almost five hours to reach it. 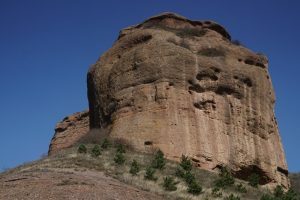 The Maijishan Grottoes, a series of 194 caves cut in the side of a stand-alone sandstone hill of Maijishan (142m in height) in Tianshui, was inscribed onto the World Heritage List as part of the series of sites under “Silk Roads: The Routes Network of Chang’an-Tianshan Corridor”. 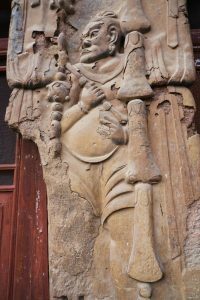 The grottoes have described as the “Gallery of Oriental Sculpture Art”. 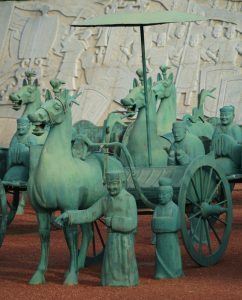 Construction and restoration extended over 12 dynasties stretching from the late Qin era (384 – 417 AD) to the Qing Dynasty. 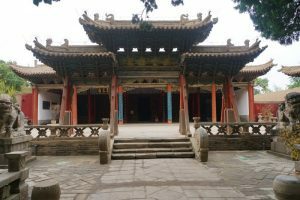 Sometime between 420 and 422 AD, a monk Tanhung arrived at Maijishan and proceeded to build a small monastic community. Another senior monk Xuangao joined a few years later. Eventually the community grew to 300 members. The earliest dated inscription from 502 AD is found in Cave 115. More than 70% of the caves were excavated in the Northern Dynasties (386-581 AD). The largest sculpture is as large as 16m-high while the smallest one is only 10 cm. During the Tang Dynasty, an earthquake in the region in 734 AD caused severe damages. 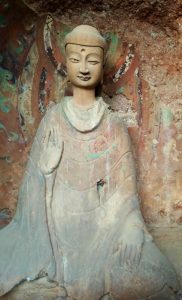 Major restoration was made during the Sung Dynasty and much of what we see today are older caves with new or replaced Sung-period sculpture. The most notable change in this period is the shift in emphasis from the Buddha to the bodhisattvas. Revival and further restoration works were done during the middle Ming Dynasty. 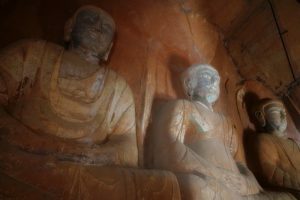 Notable works include the two huge triads of statues on the eastern and western faces of the cliff, a seated Maitreya flanked by two standing bodhisattvas on the southeast cliff face and an incomplete triad of a tall Buddha flanked by two attendants. The grottoes located on cliff face 30 to 80 metres above ground, is divided into East Cliff Area (54 caves) and West Cliff Area (140 caves). 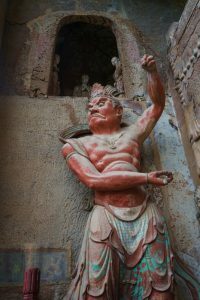 Unlike the caves in Dunhuang, the caves here are built without a central shaft. They were first properly explored in 1952-53 by a team of Chinese archaeologists. 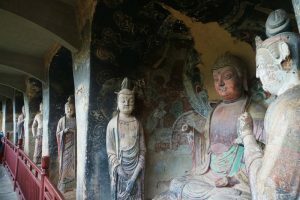 The grottoes contain over 7,200 Buddhist sculptures and 1,000 m2 of murals. 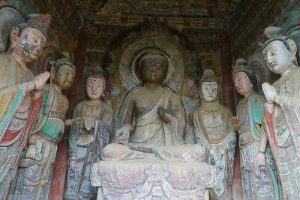 Nearly all the statues are made of clay with the addition of some sort of binding agent to help preserve the sculpture. The stone sculptures appear in caves 117, 127, 133 and 135 are generally made of sandstone. 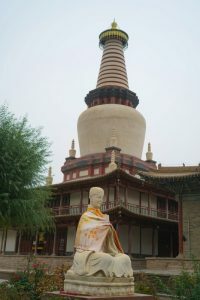 The most common Buddha here is Amitabha, the principal Buddha of the Pure Land sect. The bodhisattvas who accompany Amitabha are usually Avalokitesvara on the right and Mahasthamaprapta on the left. 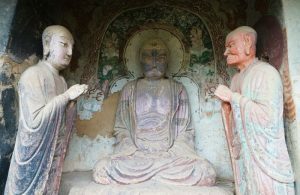 The highlights include the Cave of Nirvana, the 32-metre corridor of Thousand Buddhas, Sanhua Hall, Seven Buddha Pavilion in East Cliff Area and the outstanding Ten Thousand Buddha Hall, Heaven Cave, Cave 44, 121, 123, 127 and 165 in the West Cliff Area. We arrived at 2 pm and ran into Josephine and Kong again at the entrance. I paid ¥45 for a half-price ticket and ¥15 for the shuttle bus. We hired a guide from the visitor centre for ¥50. 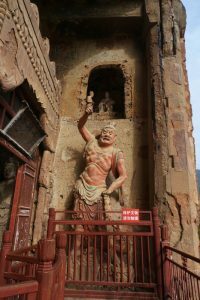 Our guide took us to a viewpoint offering the best view of the Maijishan with exquisite clay carving temple buildings under cliff. It is a most wonderful and harmonious landscape of mankind and nature! He gave a brief history of the caves, showed us the way to the staircase entrance and left. He is not professional: we should have saved our money. All visitors follow the same route starting from the eastern cliff. It can be a frightening experience to walk up and down a steep and narrow staircase/board walk on the cliff face. Most of the caves are small with bars or iron gates, dark and badly damaged. It is difficult to see the sculpture and to take photos. When standing on the Overhead Bridge (the highest platform) after looking at Caves 4 and 5, I had a surreal and peaceful view of the largest Buddha carved out of the cliff and looking out at boundless lush green mountains dotted with clusters of golden and orange leaves. It is one of the most amazing and wonderful landscapes on this trip. We left Maijishan after 5 pm and drove 45 km to Tianshui. We had a simple but delicious dinner in a local eatery which cost less than ¥50. This was our last night in Gansu. Another long driving day. We set off at 8 am heading to Guyuan. 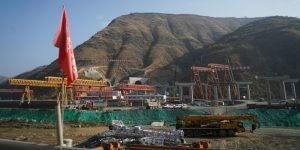 A 171km-long highway between Pinglang and Tianshui in Gansu is under construction at a cost of US$5 billion. Until its completion, motorists travelling north to Ningxia still must take the existing winding road through a mountainous region. Anyway, I had a scenic drive through hidden valleys mostly under active cultivation. It’s the harvest season with abundant apples on the trees or piling up on the roadside. We bought a couple: they were delicious and sweet. On the way, I saw numerous tunnels and bridges being built in connection with the new highway. Impressive! I am sure this expressway will bring economic benefits to the region and shorten the travel time to the Ningxia Hui Autonomous Region (Ningxia). Ningxia 寧夏 with an area of around 66,400km2 and a population of over 6 million, is bounded by Shaanxi to the east, Gansu to the south and west, and Inner Mongolia to the north. 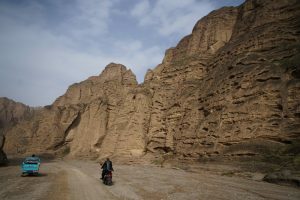 It is a relatively dry, desert-like region lying partially on the loess plateau and in the vast plain of the Yellow River. 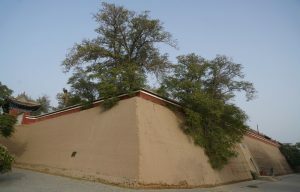 It features the Great Wall along its north-eastern boundary. Aobaogeda in the Helan Mountains is the highest point in Ningxia at 3,556m above sea level. 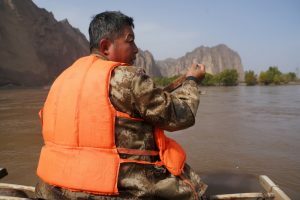 Owing to the construction of an extensive system of canals and irrigation, and land reclamation, the northern section through which the Yellow River flows, supports the best agricultural land. Cultivation of wolfberries, fruits, vegetables and commercial crops has been on the rise. But Ningxia remains the province with the third smallest GDP in China and rural Ningxia has long been officially designated poverty area. 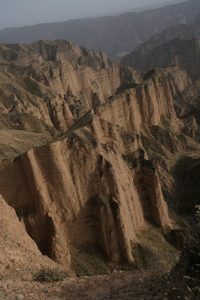 Guyuan 固原 occupies the southernmost section of Ningxia, bordering Gansu province to the east, south and due west. 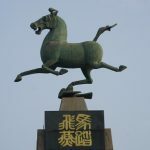 The region has a long history recorded in ancient documents since Shang (1766 -1122 BC) and Zhou (1046-256 BC) Dynasties. 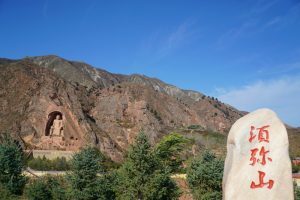 It had been a strategic town of ancient Chinese northwest frontier defence system and an essential stop of the northern bypass of the eastern Silk Road. Nonetheless, this area has been considered “one of the world’s least habitable areas for human beings”. 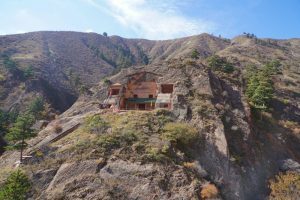 The main attractions in Guyuan are the Mount Sumeru Grottoes 须弥山, the Xiji Huoshizhai National Geopark, the Guyuan Museum and the Great Wall. 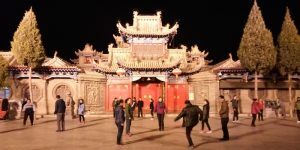 The last two attractions are in Guyuan City. The guard was sympathetic when we told him we were from Hong Kong. He kindly allowed us to drive to take a quick look. The main road cutting through the park is only a few kilometres long. 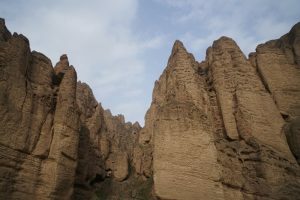 The reddish sandstone Danxia landforms with curvaceous cliffs and many unusual rock formations are different from those in Zhangye. We saw the major rock formations from the car within 30 minutes. As a token of appreciation, we would like to give the guard a small gift. But he had gone by the time we were back at the entrance. We had lunch on the way to the Guyuan City 固原市 and checked in the hotel around 4pm. We planned to visit the Guyuan Museum with over 30,000 exhibits dating back to the Paleolithic age. 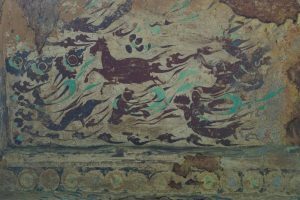 It also contains many valuable relics and artefacts from the Silk Road and ancient ethnic minorities. There is an exhibition tracking the evolution of burial sites in northern China over time. The ticket office was reluctant to let us in as it would be closing at 5pm. We begged them to allow us in as we would be leaving the following morning. Finally, we got in and had a whirlwind tour of two small display rooms near the exit. What a pity! We should have come before checking-in the hotel. We did not try to look for the ruins of the Great Wall as Bing read somewhere that the old wall had been partially demolished. 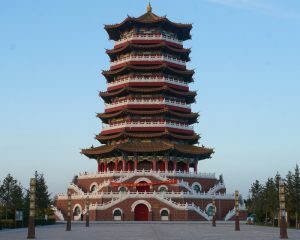 Instead we walked to the park with a prominent pagoda on the top to watch sunset and a 360°degree view of the city. The city is expanding with many new housing projects in all directions. Though it cannot be compared with the first- and second – tier cities, it does not look impoverished. I must visit the least developed rural area to find out why it has been considered “one of the world’s least habitable areas for human beings”. We set off at 8 am and arrived at the Mount Sumeru Grottoes an hour later. I paid ¥10 for a concessionary ticket and ¥10 for the shuttle bus service. We had a wonderful morning in the museum and the caves and a short but strenuous hike to see the caves. Cave construction lasted 1500 years began during the Northern Wei Dynasty (386-534 AD) and subsequently enlarged during the Sui (581-618) and Tang (618-906) Dynasties. The grottoes containing about 150 caves arranged along eight cliffside walls, stretched for a mile. 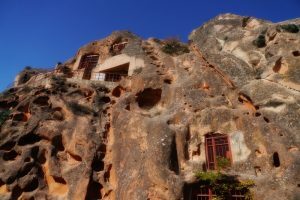 There are over 350 cliffside images including stone tablets, inscriptions, and mural paintings. 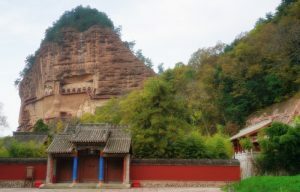 The grottoes built along the contour of the mountains feature eight scenic spots and reflect the unique style of the epoch in which they were created. 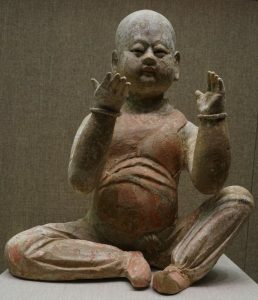 For example, the Buddha statues in the Northern Wei Dynasty retain the flavour of Indian Buddhism while the Sui’s statues are simple and pristine. The Tang’s sculpture achieves near perfection with full-size figures in luxurious attire reflecting the sophistication and high quality of the art work. 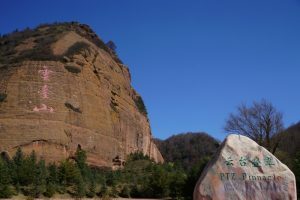 The colourful Danxia-like landscape is impressive especially on a beautiful clear day with a blue sky. We started off at the museum which focuses on Buddhism and grottoes art works. 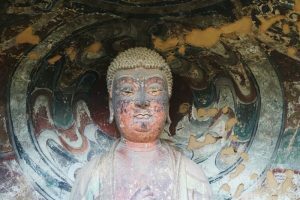 World famous grottoes in China and India are recreated here. 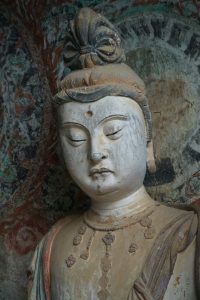 There are also many copies of the beautiful statues of Buddha and bodhisattvas from Dunhuang. The shuttle bus took us to last stop on the other side of the river. We began around the Xiangguo Temple with a large cluster of caves on the cliffside. The staircases and walk paths with useful illustrations facilitate visitors on a self-guided tour. Most of the caves are small and empty in poor conditions. I took a longer hike while Bing preferred an easy path. I visited six out of the eight scenic spots. After walking through a chasm, I reached the hidden Peach Blossom Cave. I followed a steep path to a hill top where I had fantastic panoramic views of the expansive area. There are two different paths downhill without signage. I picked a path on the left and ended up at the Yuanguang Temple. Had I taken the right on the right, I would have arrived at a Taoist temple. 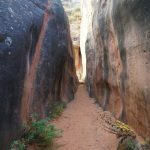 I went into the temple and a nun told me to go inside to see caves 45 -48. The sculptures are in good conditions. 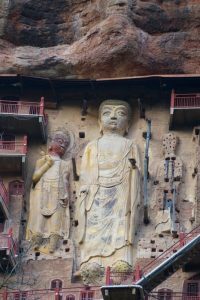 I ended the tour at the Big Maitreya Buddha (cave 5) at a height of 20.6m. We had a lovely leisure morning and did not leave till 1 pm. After having a nice lunch, we made a brief stop at the Tongxin Great Mosque 同心清真大寺in Wuzhong. 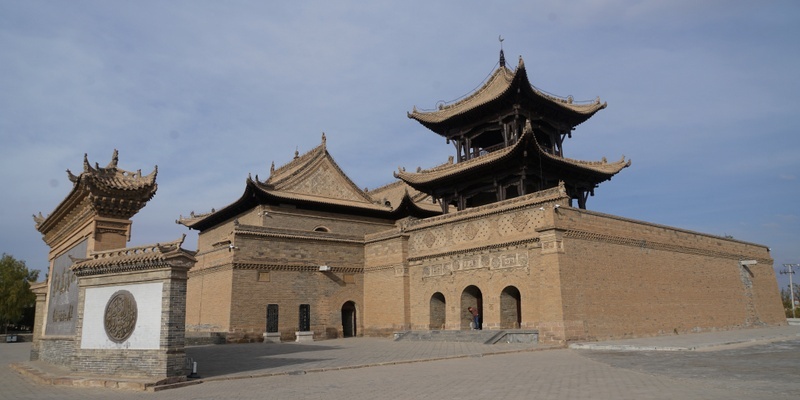 It is the largest and oldest Muslim mosque in Ningxia which has a Muslim population of about 20 million. 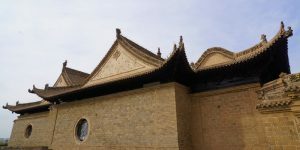 Built in the early Ming Dynasty, its architecture is in Han-style with decoration in the Islamic style reflecting a harmonious combination of Hui and Han culture. The structure with delicate decorations looks magnificent. We made good progress as we were driving on good paved road. By 6 pm, we arrived in Zhongwei 中衛with a population of over 1 million. After checking in the hotel, we had a leisure stroll in the neighbourhood. The city looks surprisingly prosperous. I met two Taiwanese tourist groups staying in our hotel. The street near the old Drum Tower is full of bars, trendy cafes and eateries. Th side streets at the back of our hotel have dozens of entertainment bars and restaurants.